Marc has worked in a variety of markets including consumer goods, B2B, not-for-profit, finance and technology. As a veteran Creative Director, he has worked on brands such as 3M, Anaren, Blizzard Entertainment, Bristol-Meyers Squibb, Dummies Brand, EMS Technologies, Food Bank of Central New York, Ingersoll Rand, Saab-Sensis, The Salvation Army, Welch Allyn and Würth to name a few. In addition to developing thoughtful solutions for brand identity, digital and print communications, Marc has designed solutions for mobile applications, email marketing, social media and digital interactive software. 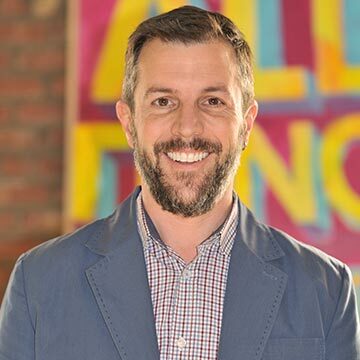 His experience includes 17 years managing a design firm collaborating with clients and creative teams on multi-tiered campaigns with budgets ranging from thousands to millions of dollars. He has been named as a person to watch by Graphic Design USA and garnered industry attention throughout his career from HOW, Print, Graphis, LogoLounge, Rockport Publishers, American Corporate Identity, The Big Book Of Logos, UCDA and others. Marc studied design, advertising and photography, earning a Bachelor of Fine Arts in Graphic Design from State University of New York at Fredonia. Marc is also a Professor of Practice of Communications Design at Syracuse University School Of Design. Outside of work, he enjoys family, cars, making cocktails, cooking and the outdoors. He rides a vintage Honda motorcycle that's perfect for touring around the Finger Lakes.